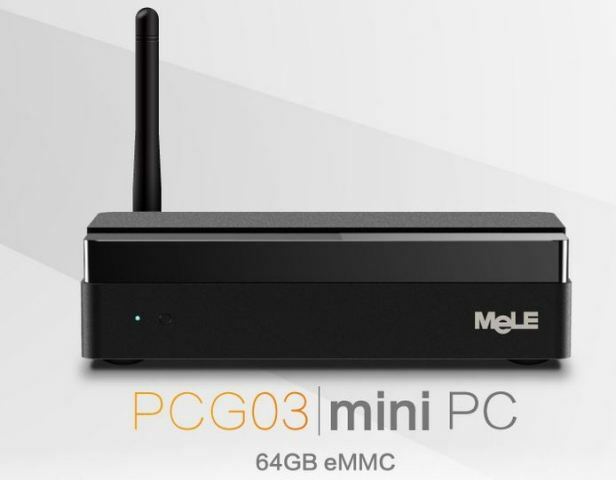 We have good news for people who wanted to buy MeLE PCG03 mini PC. MeLE (Shenzhen MeLE Digital Technology Ltd.) company introduced the model PCG03 fitted with up to 64GB of internal memory eMMC. Recently at the end of january we wrote about the MeLE PCG03 mini PC yet with 32GB of memory. 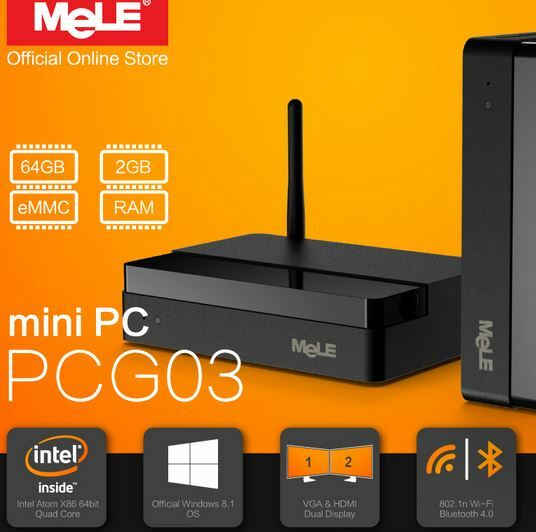 The MeLE PCG03 has inside SoC Intel Atom Z3735F Quad Core with 2GB of DDR3 memory, this limited edition has the internal storage of a total of 64GB eMMC memory, has also wireless connectivity WiFi b / g / n with external antenna and Bluetooth 4.0, three USB 2.0 connectors and Windows 8.1 has officially licensed upgradeable to Windows 10. This model has a dual screen display (HDMI to TV, VGA to monitor). SD card for storage expansion to 512GB. The finishes and cooling system of this model are also noteworthy because it keeps very controlled temperatures. The MeLe PCG03 mini PC with 64GB eMMC memory is available on Aliexpress.com (in the official MeLE store) at a special price of $201.52 + free shipping. The offer is valid for an additional 4 days. Those who pre-order the unit will have it shipped by the 25th of August.